Ashley Nolan was voted out of Survivor: Heroes vs. Healers vs. Hustlers' merged Solewa tribe during Wednesday night's episode on CBS. Mike Zahalsky, a 43-year-old urologist from Parkland, FL, earned himself one vote from Ashley. Although Ben Driebergen, a 34-year-old U.S. Marine from Boise, ID, was the real target, he had played another hidden Immunity Idol to keep himself safe. "Thirty-six out of 39 days, I couldn't have gotten much closer than that," Ashley said in her final words. "[Devon Pinto] completely went against the alliance that we had. I think there's hard feelings still for the moment, but I did a lot better than I ever would have imagined." In an exclusive interview with Reality TV World on Thursday, Ashley talked about her Survivor experience. Below is a portion of what she had to say. Reality TV World: Why do you think Devon and Ryan Ulrich succumbed to Chrissy Hofbeck's plan of taking you out before Mike? Because you would think the move would hurt Devon's game since you two were close allies and you probably would've taken him to Final 3 if it had been up to you. Ashley Nolan: Yeah, definitely. I never, never really strayed from that plan. The only thing I can think of is that I did find out later that Mike had been going between Devon and I trying to put a wedge in between us, telling Devon that I was going to be voting for him -- or that I was going to try to work against him -- and telling myself that Devon was going to try to work against me. I still wanted Devon in my Final 3, but I think maybe Devon saw an opportunity, you know, now that we had lost Lauren in that alliance and we had lost her second vote -- we felt very confident that we had Lauren and her second vote. And so, when I had all that going on, and Chrissy approached me at the loved ones Reward to swap, I was like, "No way! There's no reason to do that," you know? But we fast forward and Lauren's gone, and it's just me and Devon, and Devon saw an opportunity to get in with a different majority. And if he had in the back of his mind that maybe I was going to plot against him, I think he saw an opportunity to do it before I could. He saw an opportunity to switch on me before I switched on him. Reality TV World: That makes sense, because I couldn't figure out how turning on you would benefit Devon's game, unless he thought he couldn't beat you in the Final 3. From what viewers saw, there didn't seem to be another explanation. Ashley Nolan: Right. I mean, maybe, and that's the interesting thing too. When you get into the Final 3 with someone -- for instance, me, Devon and Lauren -- we were like, "Okay, this would be a good Final 3. I think I'd have a chance at beating these two." But what you can't predict is that the closer you do get with people, and you're getting insight on what their next move is or gameplan is, you start realizing, "Oh, they're actually better than I thought." So people you think you're going to beat and get close to, you start to realize, "Maybe I can't." Because you're starting to see the wheels turning in their head. Devon at first, I was like, "I can totally beat this guy," you know? But the closer you get to him, the more you realize their thought process and they're a stronger player than you think, so I think that may have happened between Devon and I. The closer I felt to him, the more I confided in him and so the more he realized that I was making plans and making moves more than he thought I was going to. Reality TV World: If I had been in Devon's shoes, I'd also be concerned blindsiding you may cost me a jury vote. Ashley Nolan: Definitely. And that's just -- you have to hope that it's not going to be a bitter jury, I think. Hopefully people respect the game moves. Maybe I'm just naive. I don't think I'm a pushover or anything, but as soon as I walked off, I was like, "You know, this is a game, and that was a good move. He did what he had to do." I wish he didn't, but I get it. So, I don't think I was a bitter juror in that sense, that I took anything personally. It was all respect for the game moves, so you've got to kind of hope that people are going to be like that on the jury. Reality TV World: The episode didn't show Ben actually retrieving his hidden Immunity Idol underneath the shelter. Could you tell me how he found that without anyone at camp noticing? And fans are wondering why it wasn't shown in the episode, so do you have any information on that? Ashley Nolan: I wish I could tell you! That confused me as well. Everyone was asking me that. My friends and family were asking me that. I don't know. They said it was somewhere under the bed or something. I don't remember if Ben ever disclosed that information, so it's hard to say. Reality TV World: It seemed like the tribe resigned itself to thinking Ben wasn't going to find the idol, no matter how much time he had to go looking for one. Why did you guys feel that way and looking back, would you admit it was a big mistake to not have someone constantly following Ben around? Ashley Nolan: (Laughs) Yeah, I definitely feel like we should've been on Ben duty at all times. I have no idea, like I said, when he found that last one. I think we all tried our best to keep our eyes on him, but we didn't want to be overbearing about it too. But at the end of the day, it's for a million dollars, so who cares! 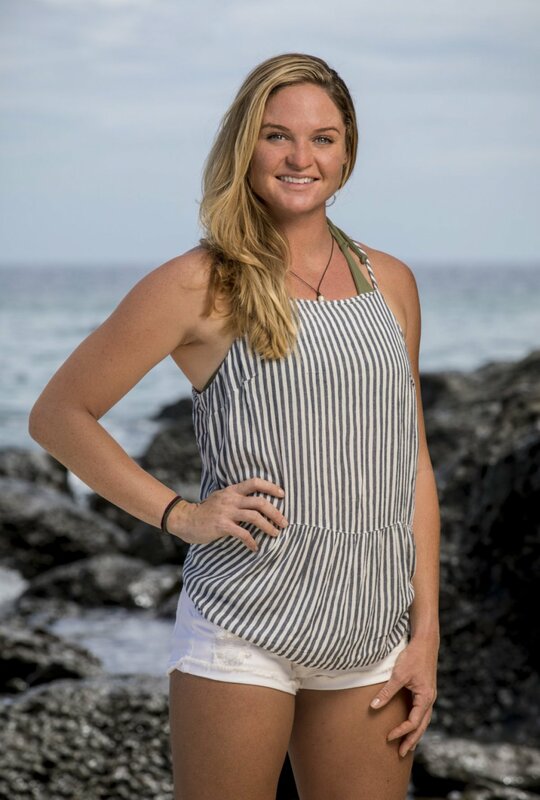 To read the first part of Reality TV World's exclusive Survivor interview with Ashley Nolan, click here. And be sure to check back with us soon for more.